Margaret (Mags) graduated from Birmingham University in 2007 alongside Alastair Webb. 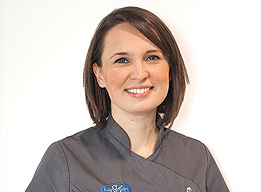 She then worked for five years in a private practice in Birmingham before joining the practice in October 2012. Mags has undergone post-graduate training to enable her to provide a wide range of treatments from fillings to dentures, tooth whitening to implant restoration. She has post-graduate training and experience in the provision of sedation for anxious patients. In any situation, her focus is to explain treatment options in full and support patients in making their own decisions about oral care. In her spare time Mags enjoys spending time with her family and baking.